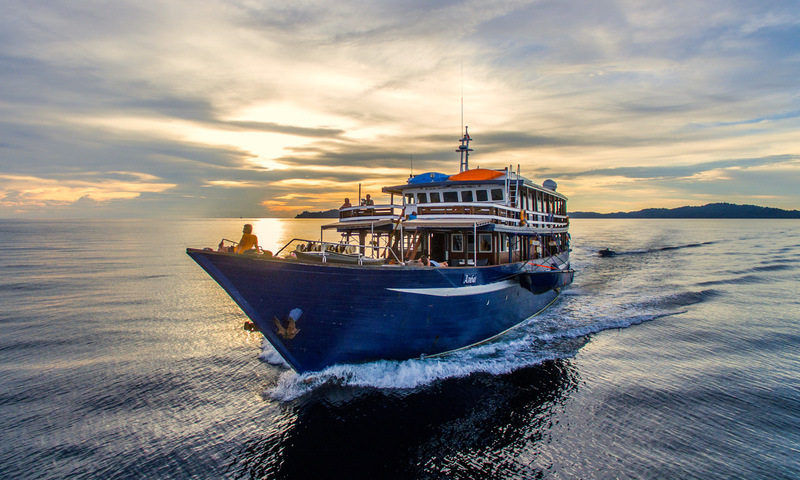 There are many scuba diving liveaboard boats in Indonesia, but MV Ambai is something special. The boat was purpose built for diving and is new (2012). 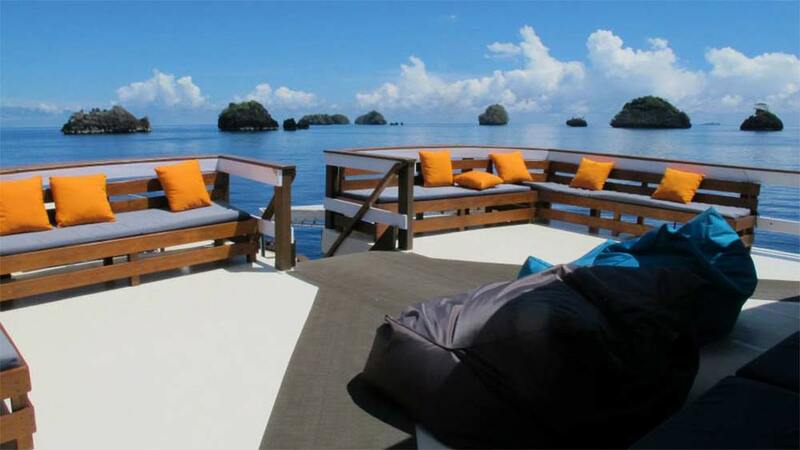 From the start, the idea was to offer 16 divers affordable luxury and the best diving possible. With a clean sheet of paper, MV Ambai was created. Everything, and everyone, on the boat is ideal for the guests to enjoy safe diving, comfortable times on board, without spending more money than necessary. And certified divers on Ambai get Nitrox fills for free! 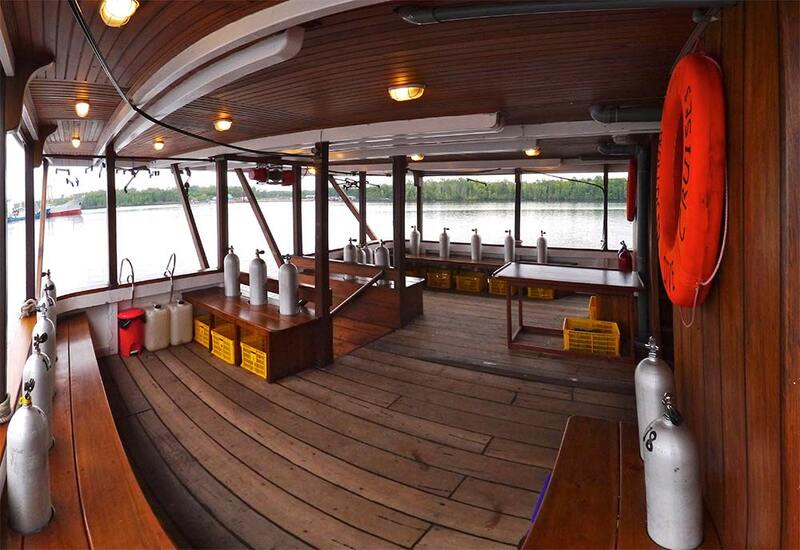 Starting with the diving platform, unlike Phinisi schooners, MV Ambai has a large and low diving platform at the rear of the boat. 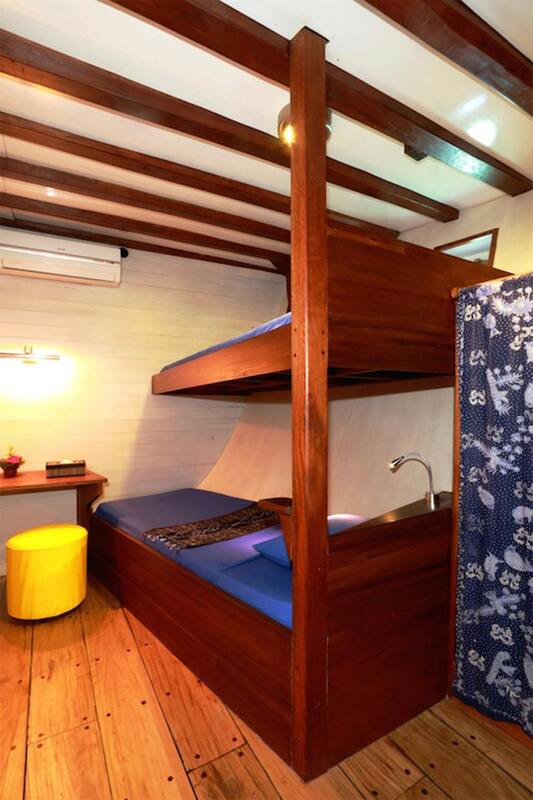 Guests are able to enter and exit the three tender dinghies very easily. The crew will always transport the tanks and equipment to or from each dinghy to ensure convenience and safety at all times. There is a dedicated room for photographers to deal with their equipment, and a large screen in the lounge for them to view or show their work. Away from the diving area, guests may forget that they are on a scuba diving trip. The communal areas, including an air-conditioned lounge restaurant and various shaded and exposed areas on deck, are spacious and comfortable. There is always somewhere to sit alone or in small groups, away from others. 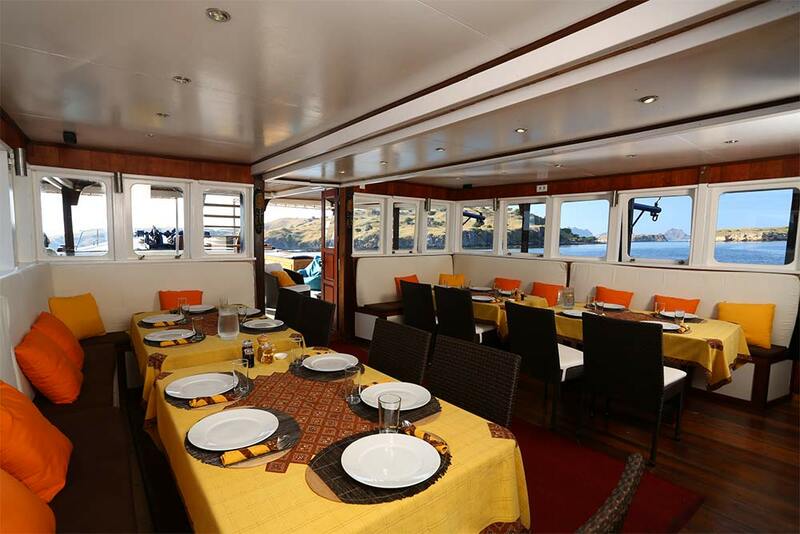 The decks are well designed with the desires of typical scuba diving liveaboard guests in mind. 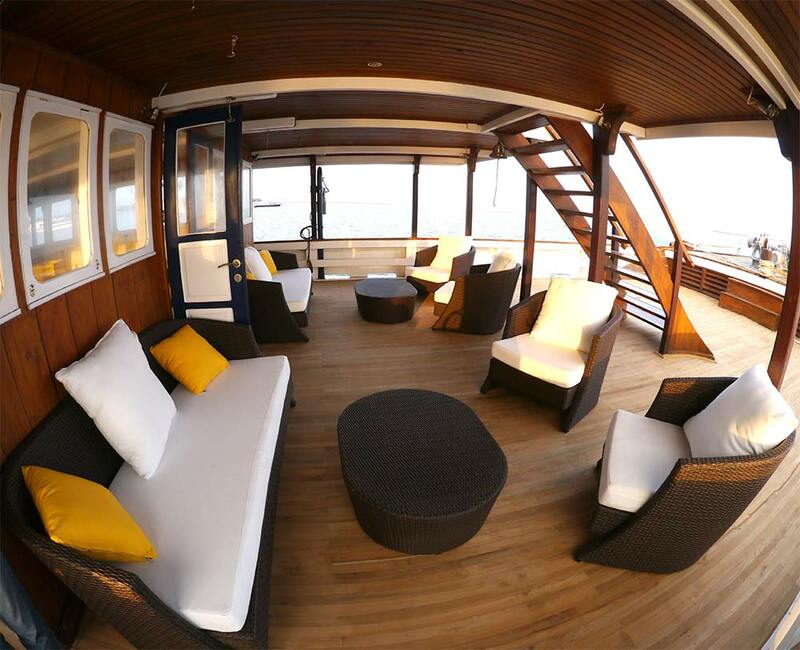 On MV Ambai there are 8 cabins, each accommodating two guests. There is a choice of twin or double beds. 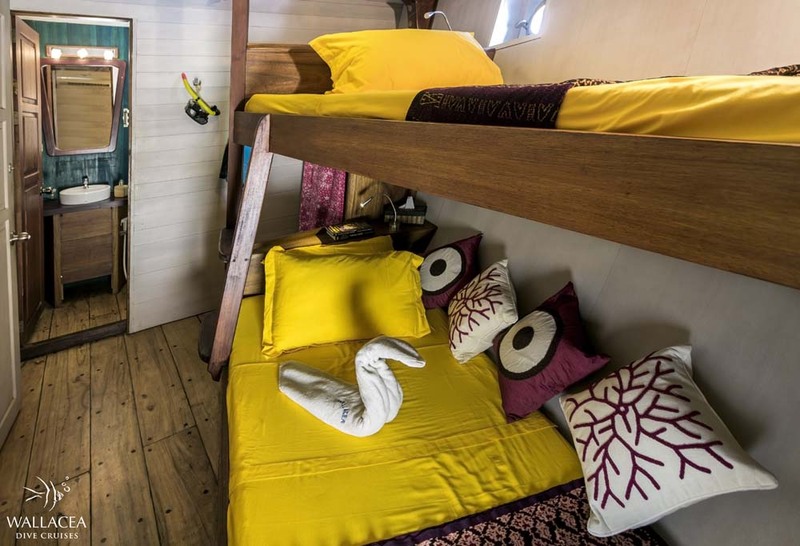 All the cabins have individually-controlled air conditioning and private en suite bathrooms with western toilets and hot & cold freshwater showers. The cabins are cleaned every day. 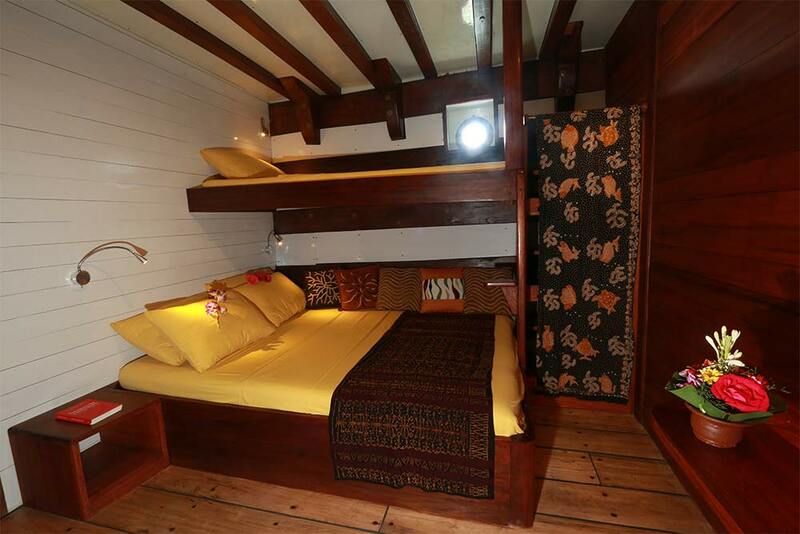 On the upper deck are two double-bed cabins, and lower down there are six more (twin & double). All of the beds are more than 200cm in length, ensuring that even the tallest guests can enjoy a good night’s sleep. Dining and A/V entertainment is enjoyed inside the air-conditioned lounge & restaurant. The food is simply delicious, and served buffet style through the cruise. Between meals there are always snacks and fruit to be enjoyed, and tea, coffee, juice & drinking water are always available. Those who have special dietary needs can easily be catered for, but please let us know in advance. There are many different trip lengths and destinations on MV Ambai. Please check the itineraries below, and the schedule, to make sure that you are looking at the correct one. Sometimes trips visit dive sites in the reverse order of the itineraries below, depending on the weather & sea conditions. Please contact us for detailed itineraries for the trips on the schedule that are not listed here. 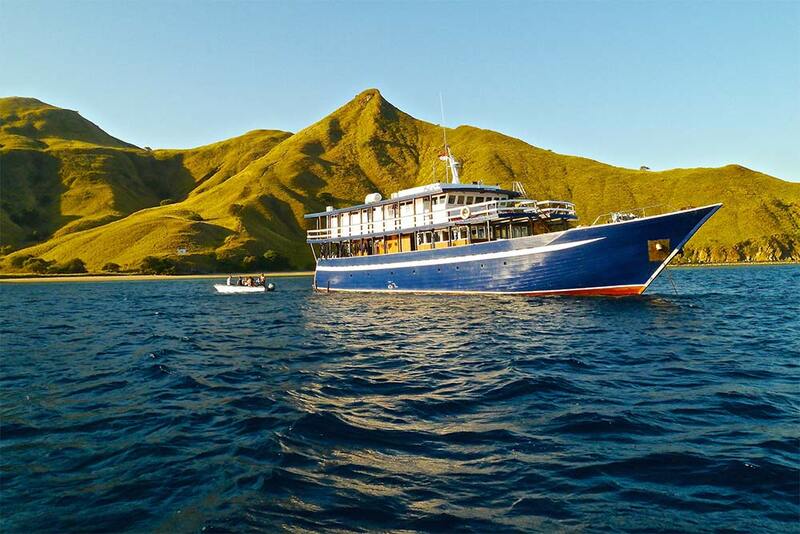 Komodo trips longer or shorter than 9D/9N have very similar itineraries to the 9D/9N trips, but with more or fewer diving days. Raja Ampat trips longer or shorter than 11D/11N have very similar itineraries to the 11D11N trips, but with more or fewer diving days. On all trips, beach excursions to visit local villages, trek up hills and look out for wildlife are available when possible. The Nitrox / EAN course is available for 120 Euros. Please let us know in advance if you are interested in taking this course. In most cases, the MV Ambai transfer team will collect guests from their hotel or the nearest airport at a pre-confirmed time, free of charge. At the end of each cruise, the same applies. Guests just need to inform us or the team where they need to go to. All the trips are planned so that each guest can enjoy every dive and fly safely more than 24 hours later. This is why there are fewer dives on the final full day, and guests disembark after breakfast the following morning. 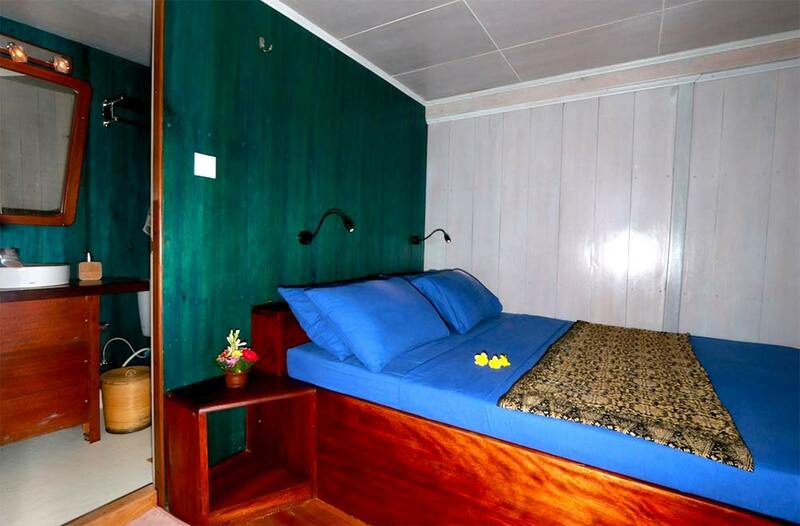 Prices are 'per person' and include full-board accommodation in a twin or double bed cabin, with two guests per cabin. 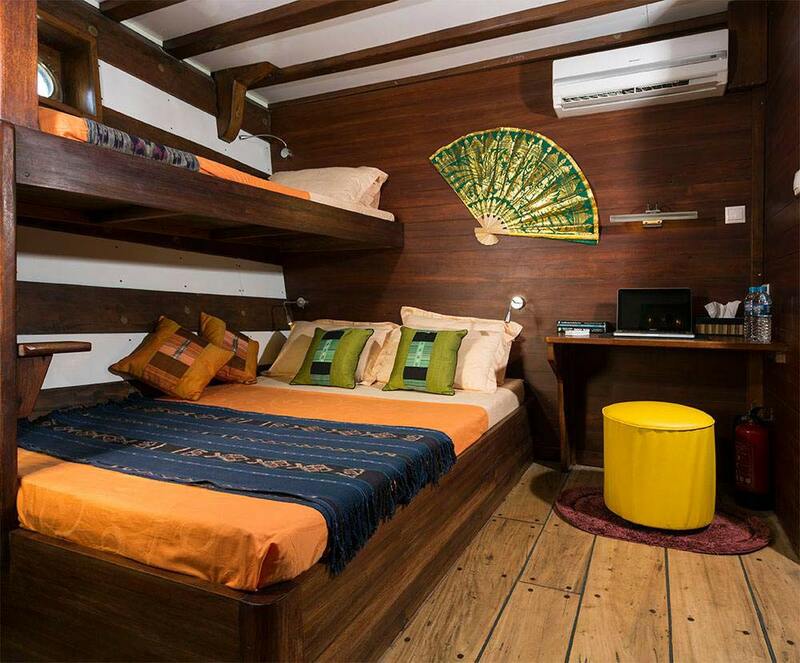 Solo divers are paired in twin cabins with another guest of the same gender. Non-diving guests are welcome at discounted rates. Please ask for details. 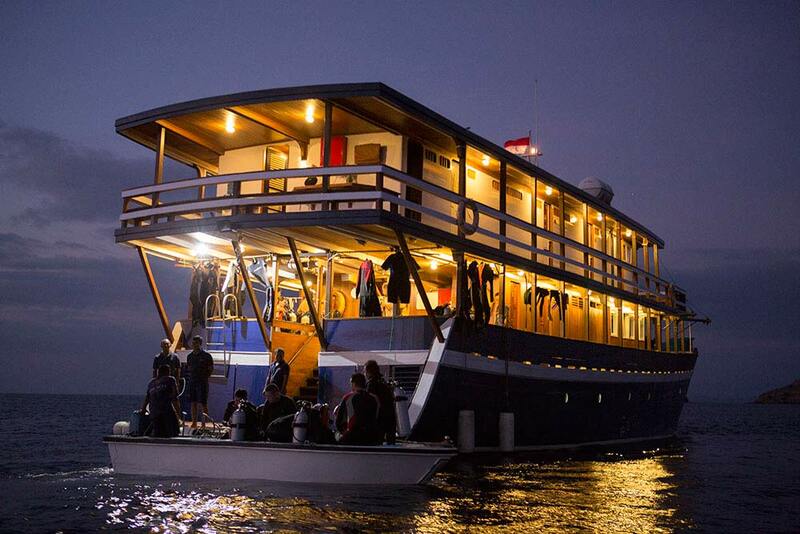 Non divers can join the trips for a discounted rate. Please ask for details.